My dog Rack is a McNab Dog, coming up on 2 years old. He's a rescue, not that there's anything wrong with that. My Lettie before him was a rescue, and if Rack would allow it, I'd probably foster another McNab. We simply aren't ready for another rescue. If and when we are, Rack will let us know. McNabs are a comparatively rare breed outside of the Western US, although I personally think that there are more of them than the "experts" think. 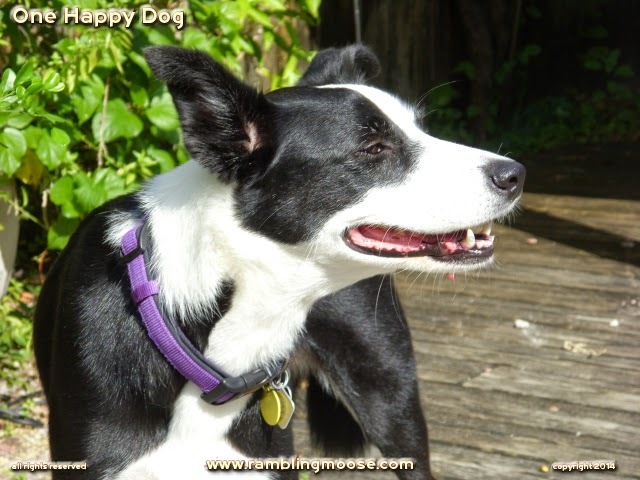 They look like a Smooth Coat Border Collie, with the main differences being that there is no undercoat, the feet are webbed, and the temperament is much more laid back. Even if a smoothie has an undercoat, there may be significant McNab blood in them, just like Lettie was. No matter what kind of dog, McNab, Border Collie, Similar Breed, or a Mix, you're in for an amazing ride! We definitely are a herding dog family, even here in the city. But they do get fearful from time to time, especially with what they're put through in the whole Shelter/Rescue/Foster/Re-homing cycle. Rack is still, almost a year and a half later, exhibiting the PTSD that you see in dogs. He hides when the house gets too loud like when things get dropped, and forget seeing him during thunderstorms. There are three places he will hide, all of which are "dens" to him. If I need him, he will come when I call if it is not thundering or, Dog Forbid, firework-y out there. All of this manifested itself in the weirdest behavioral problem I ever saw. Rack will skip meals. He simply would not eat. We have had him checked out at the Vet with this in mind and we all concluded it was behavioral. So in the house we all, myself definitely included, "tread lightly" and keep noises down. But my little furry puzzle still skipped his meals. Finally after asking a friend of a friend who once was a dog trainer in Stockholm, Sweden, we got a clue. What happened is that since Rack is such a beta dog, and a weak beta dog at that, he needs to be given permission to eat. How about that? Given Permission To Eat? A dog's reputation is that they'll sniff your food, steal food from tables, eat your own dinner if you don't guard it and train against that kind of behavior. I have seen that all in dogs that I have had in the past. But not Rack. How we are going about it, and this is definitely Work In Progress, is to have him eat with me. Rack sees me as the alpha here. He is the weak beta. When I eat, I always eat at a table now. No meals in the recliner. This rule must be rigidly adhered to, at the table. He doesn't care about setting the table, just the same ritual all the time. Rituals are important with dogs. They learn you and your routines and strive to be as much a part of it as possible. The stereotype of the rancher with the pack of cow-dogs in the back of the pickup is a great example of that. What I do in my suburban South Florida Home is that I invite my dog to the table. He would not come to the table on his own, I don't think he sees himself able of approaching The Alpha like that. First I make Rack's food. Put the bowl together and set it on the edge of the dinner table I choose. It is nearby and he can see and smell it, but it is just out of reach. I will then comment, clearly so that it can be heard, that I am hungry. That clues Rack in that something Food is happening. I cook my own food. If it has long prep time, I will prepare Rack's bowl noisily and set it on the table before I am ready to sit down with my own. Now I will begin eating. If Rack does not show, I will call him to the table. "Rack are you hungry? Dinner time!". He will come into the kitchen and slowly join me. Head down, ears down, and settle next to me as if to ask if he is allowed. I pet him and let him know it is ok.
At this time I may even take a few bites of the food. He may show interest in his own bowl. His bowl now makes it to the floor and I go on about my own food. Usually by this time, he's snuffling around the bowl and should start eating, but not every time. When he doesn't I may have to "prime the pump. If I have finished and he has not started, I will hand him a piece of kibble and get him started. It takes judgement to see where his head is at. If he takes it, try another or a small handful. It literally can be as bad as single piece of kibble for a quarter of the food before he gets to the point that he will eat on his own. This happens if we have a thunderstorm in the area and South Florida is where "Thunderstorms are Born" for six months out of the year. Normally though, it usually only takes him being given permission to eat in the morning. Evenings are a bit more difficult, so I make sure the house is quiet and try again. Some say to simply remove the food. I tried that and with My Dog, it didn't work. Since he readily skips meals, taking the food away simply made the problem worse and he was losing weight as a result. Intelligent breeds require a gentle touch. Not to say "de-dog" or "humanize" the dog, but there really is a lot of conversation going on and while dogs are excellent at reading you, you may not be so good at reading THEM. One last thought. Every dog is different. Most won't need this kind of care. But with a fearful dog, you have to understand the first thing they think might not be anything other than fear. It is up to us to figure out how to combat the fear. Most of it can be trained out. Lettie was this bad when I got her in her own way and by the end of her life, she was the Dog of a Lifetime. Rack will be too, it just takes time, patience, and training. Interesting post on fearful dogs. My STandard Poodle Viva came to me noise sensitive. whe she was all but 3 months young, she came screaming through my art studio like she was being chased by Frankenstein or ??? It turned out a dry leaf was stuck to her leg! I didn't make much of it at the time, but as the years progressed her noise sensitivity became worse with time and wind, blowing tarps, loud bumps, sudden crashes killed her. VERY SAD to us. She had an amazing aptitude for herding and agility, yet she was over the top sensitive to noise and then her vision became a challenge. At 4 years she got her agility championship and then stopped wanting to take jumps due to her visual imprairment of not depth perception! GOSH who would guess ??? Anyway, She is one of the more intelligent breeds, just has some disablities. She is till going strong @ 12 3/4 years. Love her to pieces! Standard Poodles always come in the top ten of intelligent breeds and that comes with its own challenges and benefits. You never know what they will pick up along the way whether it be a noise sensitivity or a stray leaf. All that gets solved with confidence, and one of the best confidence building exercises is Agility Training. At that point, any dog can be a Dog of a Lifetime, and it sounds like your Viva is. As for my Rack, in the past three years since this was written, we have found out that he is missing a "Pre Molar" and that effects what and how he eats. So dry food is soaked, and he will eat although it requires him to be quiet and settled. You never really know with these dogs, sometimes they get over things, and other times they'll carry that baggage along like Grandma's China. iPhone6 Killer Feature? They Bend. So how DO you know when your phone is obsolete? Every Computer Recycling Project Needs a Dog! The Last of the Mommy, Mommy! Jokes!